This is a wee gem of a show and a great start to the day. 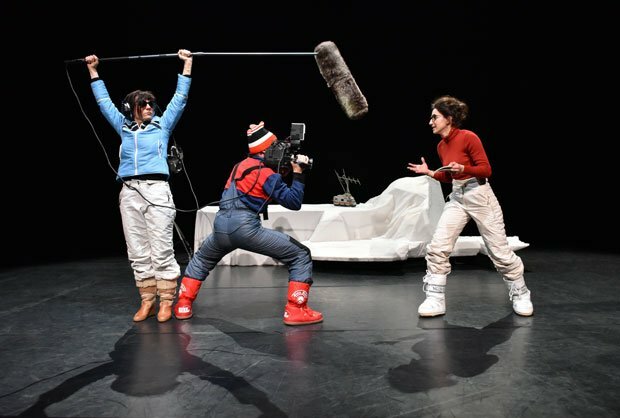 The Chaliwaté Company from Brussels brings a concentrated cast of three, who use puppets, live video feeds and deadpan clowning in ski wear to tell the story of a film crew's road trip to the North Pole. With an electric fan creating a lo-fi blizzard, props appear on the soles of giant puffy snow boots, tiny model cars zigzag over the legs of a white pair of ski salopettes, and a tiny winter landscape with miniature lights and trees is seen from a distance, almost like an enchanted model train set. As if watching a film, the simple set manages to create the impression of zooming in, panning round and changing angles, just by shifting the props and fiddling with the volume, as the trio (Julie Trent, Sicaire Durieux and Sandrine Heyraud) travel through a snowstorm in an old beat-up van. When the reporters make it to the icecap, there's a giant polar bear waiting, and an unexpectedly touching story quickly unfurls, through only a few wordless gestures and puppets. Fluffy earmuffs, vintage sunglasses and a nicely picked soundtrack only add to the charms of this piece of physical theatre. Short and very sweet. Summerhall, until 26 Aug (not 13, 20), 10.50am, £9 (£7).